1 What are the advantages and disadvantages of nuclear power plant? What are the advantages and disadvantages of nuclear power plant? ⇒⇒ The amount of fuel required is so small. Therefore there is a considerable saving in transportation cost. ⇒⇒ Generation from nuclear power plant reduces the usage of fossil fuel ( coal and petroleum oil ). Fossil fuels are used much faster than they are produced. ⇒⇒ This power plant is economical for producing bulk power. ⇒⇒ This power plant does not pollute the atmosphere like thermal power plant and diesel power plant. ⇒⇒ It requires less space compared to other power plants. ⇒⇒ It has a low running charge. A small amount of fuel is used to generate a large amount of electricity. ⇒⇒ It ensures the reliability of operation. ⇒⇒ Fuel is expensive and difficult to recover. ⇒⇒ The capital cost of a nuclear power plant is high as compare to other power plant. ⇒⇒ The fission by-products are generally radioactive and may cause a dangerous amount of radioactive pollution. ⇒⇒ Specially trained employers require for operate the power plant. ⇒⇒ This power plants are not suitable for varying loads because the energy generated by a nuclear power plant is constant for the time of generation. ⇒⇒ Fission by-products are radio-active and may cause the dangerous amount of radioactive pollution. ⇒⇒ Disposal of by-product which are radioactive is a big problem. They have either to be disposed off in a deep trench or in a sea away from sea-shore. Hope now you know the pros and cons of this power plant. For better understanding about the risks and benefits of nuclear power plant, we will see some brief about the nuclear power plant. As we know generating station which generates electricity from nuclear fuels called nuclear power plant. In the nuclear station, heavy elements such as Uranium (U235) or Thorium (Th232) are subjected to nuclear fission in a special apparatus known as a reactor. Heat energy from fission is utilized to produce high pressure steam. Then high pressure steam fed to a steam turbine. An alternator is attached with turbine So with the rotating of steam turbine alternator also rotates which converts mechanical energy into electrical energy. The most important feature of this plant is that a large amount of electricity can be produced from a small amount of fuel. It has been found that 1 Kg of Uranium (U235) can produce as much energy as can be produced by the burning of around 4,500 tons of high grade coal. That’s pretty much good. Although recovery of nuclear fuels (uranium and thorium) are difficult and expensive. 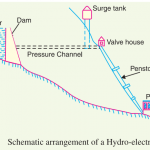 Availability of water : power plant require some water for cooling purpose so if a power plant is located near the water source it would be beneficial. Distance from a populated area : The site selected for a nuclear power station should be away from the populated areas. This power plant is quite dangerous because here produce some radioactive ray. However, as a precautionary measure, a dome is used in the plant which does not allow the radioactivity to spread by wind or underground waterways. Hope now you understand the advantages and disadvantages of nuclear power station. If you have any question regarding this article ask in the comment section. i want to tell you in certain month i following this site and i found really good articles.